NIAGARA-ON-THE-LAKE, July 26, 2013 – Premiers called on the federal government to fulfill its 2011 commitment to establish a distinct Canada-wide disaster mitigation infrastructure initiative that would be cost-shared fifty-fifty with the federal government, separate from other programs such as the Building Canada Plan. 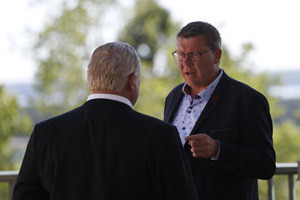 Premiers also called on the federal government to maintain the current level of financial assistance available under the Disaster Financial Assistance Arrangements to provinces and territories to help Canadians deal with natural disasters. 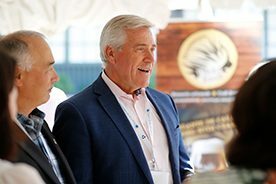 Premiers called on the federal government to commit to improve search and rescue response times, and conduct a thorough review of marine safety. For example, federal regulations should better address remediation of shipwrecks in Canadian waters and the federal government should take responsibility for the removal of shipwrecks due to inherent hazards. They also called upon the federal government to reconsider its decision to close a number of Marine Rescue Sub-Centres and Marine Communications Traffic and Service Centres throughout the country. 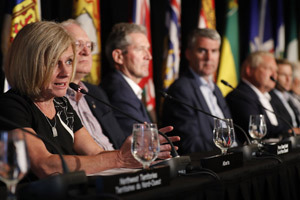 Premiers acknowledge the successful collaboration with the federal government to develop the National Public Alerting System, but urge that broadcasters work collaboratively with provinces and territories to move towards implementing a mandatory system. Premiers note that serious inadequacies in emergency management in Aboriginal and remote communities remain and cooperation among governments is essential to improve services in these communities. Following the tragic events that occurred at Lac-Mégantic, Premiers discussed the transport of hazardous materials by train. They agreed on the need to take necessary measures to ensure that such disasters never occur again. They noted that there is a clear lack of information on hazardous materials travelling on the rail network. 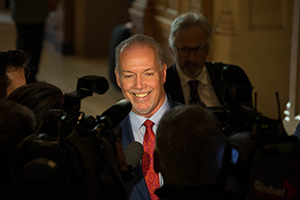 Premiers agreed that a system should be put in place by the federal government to monitor rail convoys transporting hazardous materials. This system would provide real-time data on the location and content of the trains, which would be shared, for public safety purposes, amongst the relevant authorities of the federal, provincial and territorial governments. Premiers also noted that federal regulation provides that railroads must maintain liability insurance in an amount sufficient to cover the costs associated with the damage for which they are responsible. 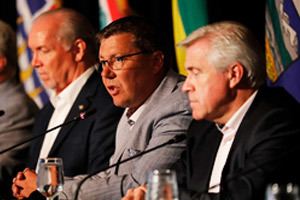 Premiers called on the federal government to take the necessary measures to ensure that the safety and liability insurance requirements are sufficient.